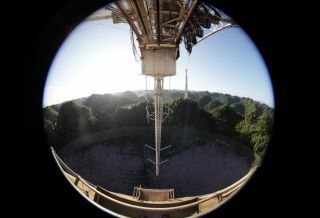 A consortium led by University of Central Florida will support the Arecibo Observatory in Puerto Rico, letting it continue operation without the National Science Foundation. Built into a sinkhole in Puerto Rico, the Arecibo Observatory is one of the most easily recognizable telescopes in the world. But its renown hasn't kept it safe from funding concerns in recent years. A new announcement, however, puts the observatory on better footing. Last fall, the National Science Foundation (NSF) suggested that it was working with potential partners to keep the observatory open. This week, the NSF announced that the enormous radio telescope would soon be under new management in the form of a consortium called the Arecibo Observatory Management Team, led by the University of Central Florida (UCF) in Orlando. "We have confidence that the new partnership will promote astronomical science and ionospheric research investigations with vitality." The new agreement is valued at $20.15 million over five years, subject to the availability of funds, and is scheduled to begin April 1, according to the statement. The new partnership represents a mixture of academic and corporate interests. The Universidad Metropolitana in San Juan, Puerto Rico, and Yang Enterprises Inc. in Oviedo, Florida, will partner with UCF to manage the observatory. The team plans to expand the capabilities of the telescope, officials said. "The observatory will provide a valuable new dimension to space science at UCF while creating more academic opportunities for students and faculty at UCF, in Puerto Rico and beyond," UCF President John C. Hitt said in the statement. UCF will provide oversight to the Arecibo Observatory Management Team. "This agreement, made possible through partnerships, also ensures that the observatory will continue to make significant contributions to space science and mankind," Hitt said. Universidad Metropolitana will focus on public outreach and engagement through formal and informal education. By providing hands-on opportunities at the observatory, the partnership will help create a pipeline for students to study space sciences both in Puerto Rico and in central Florida, the statement said. "Universidad Metropolitana is proud to be a partner in this new project for the Arecibo Observatory," said Chancellor Carlos M. Padin, who oversees the nonprofit institution of higher learning, which is part of the Ana G. Méndez University System. "We are confident this partnership will expand the opportunities for research, as well as formal and informal STEM [science, technology, engineering and mathematics] education in Puerto Rico." Yang Enterprises Inc. provides architecture and engineering, operations and maintenance, and logistical services for several NASA centers, the U.S. Air Force and multiple Fortune 500 companies. The corporation will be responsible for facilities infrastructure, engineering, operations, maintenance, information technology and support services, as well as logistics and security services. It plans to introduce new technologies and cutting-edge tools to support Arecibo's requirements and minimize operations. The company founder and Executive Vice President Tyng-Lin (Tim) Yang has worked with UCF before. He earned his Ph.D. in civil engineering at the school in 1990 and has served as an adjunct professor and on the Dean's Advisory Board for the College of Engineering and Computer Science. Together with Yang Enterprises President and CEO Li-Woan Yang, Tyng-Lin Yang helped build the company to a multi-million-dollar enterprise. "This project presents a unique opportunity for Yang Enterprises to support not only space research, but also support the Arecibo community and the educational and scientific communities of the globe," Tyng-Lin Yang said. In the past few years, Arecibo has suffered a number of financial setbacks. The NSF has funded the observatory since the 1970s, according to the statement. In 2010, the foundation received input on the priorities for its scientific operations through several reports from the National Academies and NSF committees. Based on that input, the NSF began to examine the options for continuing Arecibo. A 2012 review of NSF's astronomy portfolio recommended cutting support for several smaller and older facilities. That report didn't advise shutting down Arecibo at the time, but it did recommend evaluating the observatory's status later in the decade, which included the possibility of dismantling the enormous instrument. In the fall of 2017, Hurricane Maria struck Puerto Rico, bringing a temporary halt to the deliberations as the local population struggled to meet basic needs for food and shelter. The damage to the telescope was minimal, but preliminary assessments from the NSF anticipated spending between $4 million and $8 million on repairs. The telescope's fate was clarified a few months later, when the NSF announced that it would pursue its preferred option "to collaborate with interested parties to maintain science-focused operations at the observatory with reduced agency funding." According to Science magazine, the agency said it was only able to do so because "one or more" viable partners had made proposals to work with the agency. Now, the identify of at least one of those proposed partners has come to light as the Arecibo Observatory Management Team. "We didn't make a bid for this project lightly," said Elizabeth Klonoff, vice president for UCF's Office of Research and Commercialization and dean of the College of Graduate Studies. "The kind of science we can conduct with this observatory is important, and we didn't want to see it go dark," she added. "We performed several analyses and reached out to partners to ensure we came up with a plan that is economically prudent and that ensures Arecibo will be in operation for years to come." Completed in 1963, the observatory covers 118 acres (48 hectares). Its crowning feature is the 18-acre (7 hectares) reflector, a massive radio dish that covers nearly 24 football fields. Researchers chose Arecibo's location in Puerto Rico because it boasts karst terrain, a special topography made up of soluble rocks such as limestone, with sinkholes and underground caves. While exploring the terrain, scientists found a sinkhole with a shape nearly perfect for the observatory's massive dish. Over the last 55 years, the telescope has played key roles in several scientific discoveries. Physicists Russell Hulse and Joseph Taylor used the observatory to monitor a pair of rotating stars known as pulsars. The researchers' observation of the binary pulsar system provided a strict test of Einstein's theory of general relativity and the first evidence for the existence of gravitational waves, earning the scientists a Nobel Prize in 1993. Today, the observatory searches directly for gravitational waves by hunting for tiny changes in the arrival time of light streaming from pulsars. In 2016, Arecibo discovered the first repeating fast radio bursts, millisecond radio pulses from outside the galaxy whose origins remain a mystery. In 2017, the observatory identified two strange pulsars that occasionally turn off. This goes against scientists' understanding of the spinning neutron stars, which sees them as engaging in consistent, clock-like pulsing. The observatory's scientific legacy also includes the first use of radar ranging to determine an asteroid's distance from Earth when crossing the planet's orbit, early mapping of several objects in the solar system and the first detections of planets in orbit around other stars, according to SRI International, which manages the observatory alongside the NSF, the Universities Space Research Association and the Universidad Metropolitana. The observatory has also appeared in films such as "Contact" and "GoldenEye," and on TV shows such as "The X-Files." "The Arecibo Observatory is a very special place," Francisco Córdova, who is the current director of the observatory and will continue to serve in that role, said in the statement. "It is currently the leading research facility in the areas of radar sciences, planetary sciences and space atmospheric science in the world," he said. "We are very excited about this new collaboration. I believe together we can do great things and continue to push the boundaries of science and STEM education across the globe."